Today is a good day for Elizabeth Warren: Thanks to the agency Warren helped created, American Express will have to refund $59.5 million to more than 335,000 customers who were slapped with fees now deemed illegal. The Consumer Financial Protection Bureau (CFPB) announced today that between 2000 and 2012, the credit card company engaged in numerous deceptive marketing practices, which resulted in millions of fraudulent charges to its customers. Now, the CFPB is demanding that American Express end the illegal programs in question, pony up to the customers it bilked, and pay a $9.6 million penalty to the bureau. They involved such programs as Account Protector, an add-on offering that led some consumers to believe their minimum monthly payment would be canceled if they experienced financial hardship due to unemployment, disability or other major life event. However, the benefit payment was limited to 2.5% of a consumer's outstanding balance, up to $500. In many cases, that amount was less than the minimum payment due, regulators said. Consumers were falsely led to believe the protection would last up to 24 months. And they were told there would be no fee if the account balance was paid in full each month — but weren't told the balance had to be paid before their regular payment due date. Separately, American Express subsidiaries used telemarketing sales calls in Spanish to market a "Lost Wallet" protection program to Puerto Rico consumers. But the marketing sales scripts varied, and material sent to the consumers was written in English. As a result, the consumers weren't adequately alerted to the steps needed to receive full benefits. So, pretty sleazy stuff. After the CFPB ruling was announced, spokesman for American Marina Norville laughably claimed that the company wants “to be completely honest, fair and transparent with [its] customers.” RIght. Indirectly, this is all thanks to Warren. Before she was a Senator, she was responsible for dreaming up the CFPB, a government agency intended to protect regular Americans from deception and trickery at the hands of America’s financial elite. 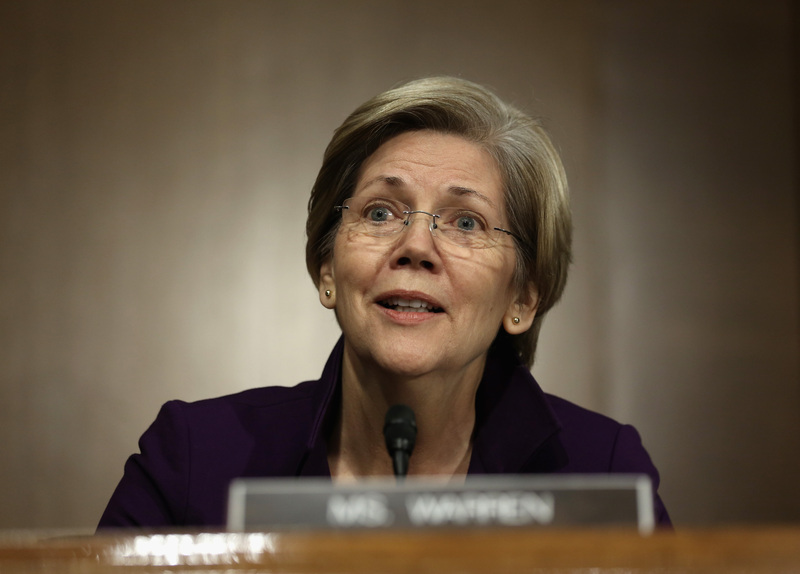 It came into being as part of the Dodd-Frank financial reform bill, and Warren herself was the President Obama's original choice to lead the agency. But Republicans in the Senate blocked her nomination; they opposed the CFPB’s very existence (consumer protection, bad! ), and would do everything in their power to prevent it from functioning as intended. Eventually, Obama appointed Richard Cordray instead (If you inadvertently pictured actor Rob Corddray when you read that, that makes two of us). Blocking Warren’s nomination backfired for Republicans in a big way, because that was what inspired her to run for the Senate. In other words, had Republicans simply allowed the nomination of a qualified individual to proceed, GOP wonder boy Scott Brown would likely still be in the Senate, and Warren — probably the most populist elected official in America — wouldn’t be sitting on the Banking Committee. Oh, Republicans.